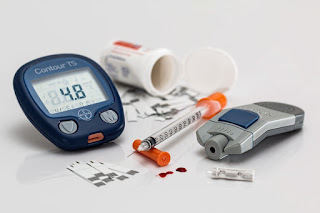 Diabetes is a chronic disease of high blood glucose (sugar) level than the normal level, and is due to either the pancreas not producing enough insulin or reduced tissues sensitivity, or both. Insulin: A hormone produced by the pancreas to help control and maintain blood glucose. Type 1 diabetes: This type occurs when insulin producing cells are completely disrupted and become unable to produce the hormone. Usually, this type of diabetes affects young people. Type 2 diabetes: When the body can produce insulin either in insufficient amounts or normal amounts but ineffective. Gestational diabetes: High blood glucose as a result of the hormones produced by the placenta during pregnancy and often disappears after delivery. Secondary diabetes: Is diabetes that results as a consequence of another medication and hormones or pancreatic surgery and other reasons. Feeling very thirsty / mouth dryness. A tingling sensation or numbness in the limbs. Glycated hemoglobin (A1C) test (acumulative diabetes). Diagnosis is done in two different dates. Genetic Factors: Your risk increases if a parent or sibling has type 1 diabetes. Obese: The more fatty tissue you have, the more resistant your cells become to insulin. High fat in the blood. Laziness and lack of physical activity. Cardiovascular Diseases: Diabetes dramatically increases the risk of various cardiovascular problems, including coronary artery disease with chest pain (angina), heart attack, stroke and narrowing of arteries (atherosclerosis). Nerve damage (neuropathy): Excess sugar in the blood can injure the walls of the tiny blood vessels (capillaries) that nourish your nerves, especially in your legs. This can cause tingling, numbness, burning or pain that usually begins at the tips of the toes or fingers and gradually spreads upward. Kidney problems (nephropathy): High blood glucose leads to kidney failure or kidney diseases. Retinopathy: High blood sugar damages tiny vessels that bring nutrients to the retina, blocking the passage of light to the retina. Feet problems: Nerve damage in the limbs, particularly the feet, makes the patient unable to feel the pain of an injury which can lead to ulcers in the foot. Checking your blood sugar regularly at home. Taking care of your feet and checking them daily. • Eating healthy foods by choosing those lower in fat and calories and higher in fiber. Focusing on fruits, vegetables and whole grains. Checking blood pressure at each visit. Checking weight at each visit. Checking feet every 6 months. Checking accumulative sugar every 6-12 months. Checking cholesterol and triglycerides every 12 months. Checking eyes every 12 months.